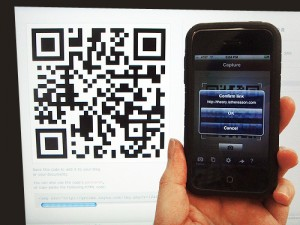 "Radio4 in the UK has an interesting report about placing QR Codes on tombstones. (See the picture to the right for a typical QR code.) Edward Stourton of the Sunday morning religious news and current affairs programme, recently interviewed Steven Nimmo, a funeral director from Dorset, to find out how digital 'quick response' codes are being placed on gravestones. Scanning the code with a smart phone directs people to a webpage where they can find a wealth of information about the deceased. You can listen to the audio from the radio programme at http://www.bbc.co.uk/programmes/p00z02tn." This audio link is worth about 2.42 minutes of listening... it is a really cool way to remember love ones. It is similar to the "Memorial Madallions" we heard about in the last few years. Technology and genealogy marches on!